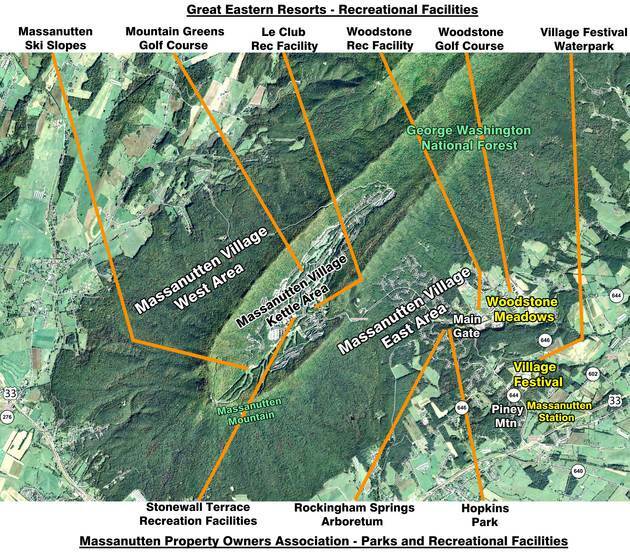 The Massanutten Community has many parks and recreational facilities in the Massanutten Village, Woodstone Meadows, and Village Festival areas that would become a part of the town of Massanutten, as shown below. The relevant question is whether these parks and recreational facilities will remain in private hands or be transferred to the town. Currently, all parks and recreational facilities are privately owned and operated by either Great Eastern Resorts (GER) or Massanutten Property Owners Association (MPOA). It is important to recognize that parks, in general, require very little staffing and net little, if any, revenues for the owner(s). Alternatively, recreational facilities, in general, require appreciable staffing and net more significant revenues for the owner(s) — with the exception of recreational amenities that are provided for exclusive use by the owner(s) at no cost, which thus net no revenues at all. Therefore, the ownership of parks and amenities is more likely to be transferred to a town, whereas the ownership of recreational facilities is less likely to be transferred. If Massanutten incorporates into a town, GER (as a private corporation) would retain ownership of its recreational facilities. These facilities included a significant investment by and provide significant income to GER. Similarly, MPOA would likely retain private ownership of its recreational facilities. These recreational facilities provide MPOA with net revenues that help defray costs of the services and recreational amenities provided to its members. MPOA could decide to transfer these recreational assets and along with the associated staff functions and net revenues over to an incorporated town of Massanutten. However, if incorporated, a town of Massanutten will most likely NOT include any town recreational facilities that net revenues. Massanutten Village has a few parks and many open spaces that are owned and maintained by MPOA for use by its members and visitors to Massanutten. These parks and open spaces could be legally transferred by MPOA to an incorporated town of Massanutten for maintenance and use by its citizens and the general public. The MPOA owned parks and open spaces are currently maintained by the same crews that maintain MPOA roads. If the MPOA owned roads are turned over to an incorporated town of Massanutten, it is logical that the MPOA parks and open spaces would also be transferred. An incorporated Town of Massanutten’s parks and open spaces would be entitled to receive state and federal funding for improvements. This type of funding is generally not available to a property owners association like MPOA. If Massanutten incorporated into a town, it would have many opportunities currently not available. If the open spaces were transferred to a Town of Massanutten, the town would be able to establish small «pocket parks» throughout the community. Children would then have areas within their neighborhoods to play outdoors that would be safe, rather than playing in the street areas. Also, if the roads and open spaces were transferred to a Town of Massanutten, town trails could be constructed throughout the community connecting various sections using these parcels of land. State and federal grants may be available for construction of trails along roadways enabling residents and visitors to walk and bike with greater safety. And, if the Rockingham Springs Arboretum were transferred to a Town of Massanutten, state and federal grants could be obtained for the improvement of the Arboretum grounds as well as reconstruction of historic structures such as Hopkins Cabin and the spring houses, originally built in the late 1800’s.